Using state-of-the-art measuring and microprocessor technologies, Advanced has assembled a series of systems which can measure mass flow rate of gas streams; measure and control mass flow rate; or perform gas blending operations--all with extremely high accuracy. 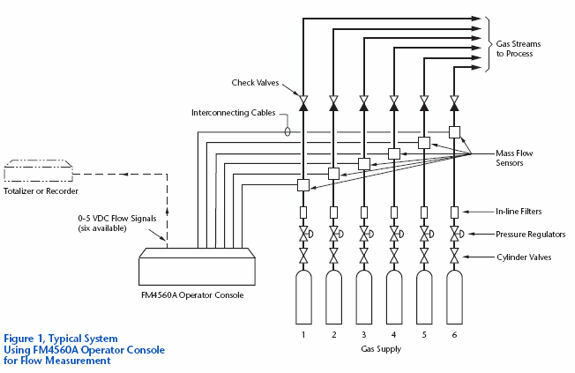 These systems (illustrated in Figures 1–4) each consist of an Operator Console which is electronically coupled to one or more Mass Flow Sensors and/or Mass Flow Control Modules. Using the measuring principles, Mass Flow Sensors can measure gas flow with a ± 1% of full scale accuracy. Since they do not control gas flow, Mass Flow Sensors are only used in applications requiring flow measurement. Capable of working with any of our Operator Consoles, Mass Flow Sensors are available for measuring flow rates in ranges as low as 0.1–5 sccm to ranges as high as 20–1000 slpm. For complete specifications on flow sensors. Mass Flow Control Modules measure flow using the same principles as our Mass Flow Sensors. They also, however, feature an integral electromagnetic control valve which additionally gives them the ability to control gas flows with a ± 1% of full scale accuracy. Based on this control capability, they can also be used to perform gas blending operations. Note: Mass Flow Control Modules have both a minimum and a maximum pressure differential requirement—that is, the pressure drop across the module cannot exceed 50 psi and must be at least 5 or 10 psi (depending on the model) for proper operation. In operation, the Modules will create their own minimum pressure drop. Users should take care, however, to ensure that they do not create conditions which will cause less of a pressure drop or conditions where the pressure drop will exceed 50 psi. Available in two different models, all Mass Flow Control Modules are capable of working with either our FM4595, FM4575A or FM4660A Operator Consoles. Each model is equipped with a user selectable "soft start" feature* which, when enabled, virtually eliminates any overshoot and undershoot in flow settings. * Mass Flow Control Modules are shipped with the "soft start" feature disabled. 1. Fast Response Control Modules are offered in ranges from 0.1–5 sccm through 20–1000 slpm. They feature a 3 second response time with minimal overshoot and undershoot. In addition, these modules are relatively "attitude insensitive," allowing them to be installed in any mounting orientation with little effect on accuracy. 2. High Pressure Control Modules can operate at inlet pressures as high as 4500 psig. They are available for flow ranges from 2–100 sccm up to 0.4–20 slpm. As with our Fast Response Modules, the High Pressure Modules are also "attitude insensitive" and may be mounted in any orientation with minimal effect on accuracy. For complete specifications on Control Modules. Operator Consoles are available in four different models—each capable of handling a number of specific functions. 1. Model FM4560A is used when only flow measurement is desired. As illustrated in Figure 1, it can operate with up to six separate Mass Flow Sensors, allowing simultaneous measurement of six gas streams. 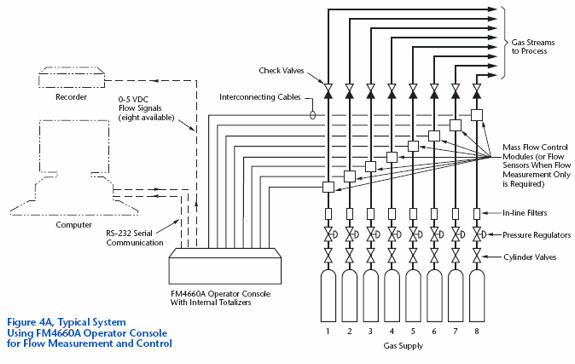 Since this console does not offer a command signal, it cannot be used with Mass Flow Control Modules. 2. Model FM4595 can be used for flow measurement or for flow measurement and flow control. As shown in Figure 2, it will operate with 1 Mass Flow Sensor or 1 Mass Flow Control Module. produce gas mixtures of two to four components (see Figure 3B). 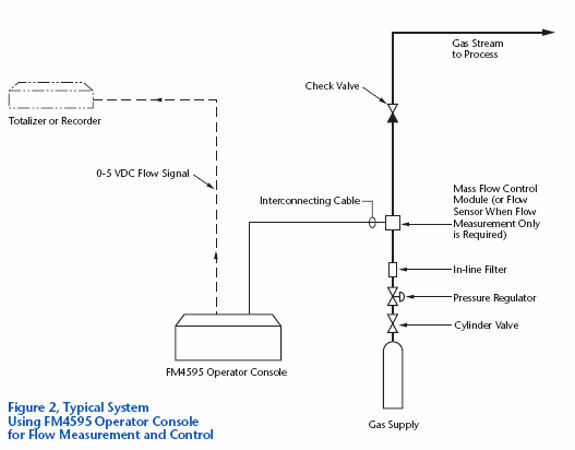 Note: Mass Flow Sensors may also be used with Model FM4575A for any gas streams requiring flow measurement only. 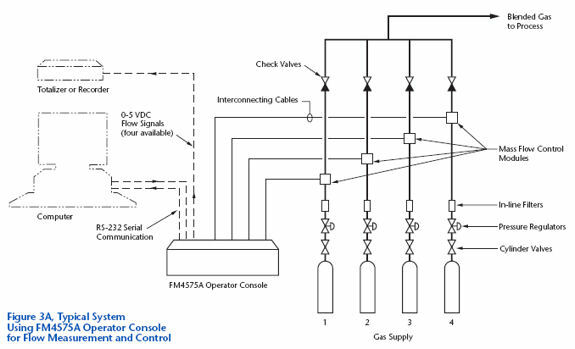 Provided with a standard RS232 serial interface port, the FM4575A can be coupled to an external computer for automated operation. built-in totalizers which maintain a record of cumulative gas usage through each of the control modules or sensors. an RS232 serial interface port for computer controlled operation or for data logging requirements. The FM4660A can also be used for gas blending, having the ability to manufacture gas mixtures of two to eight components. 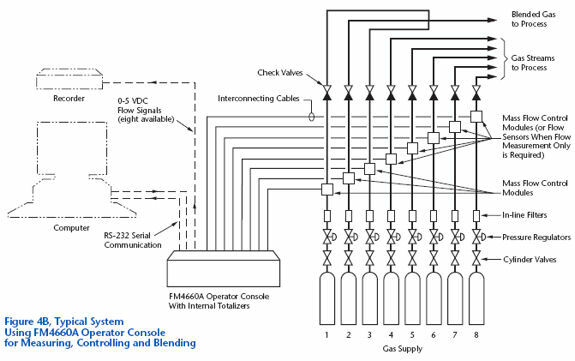 As shown in Figure 4B, this sophisticated console can perform blending operations while simultaneously measuring and/or controlling gas flows. For example, Channels 1, 2 and 3 can be used for producing a 3 component gas mixture, while channels 4 through 8 remain available for separate measuring/controlling applications. For specifications on Operator Consoles. 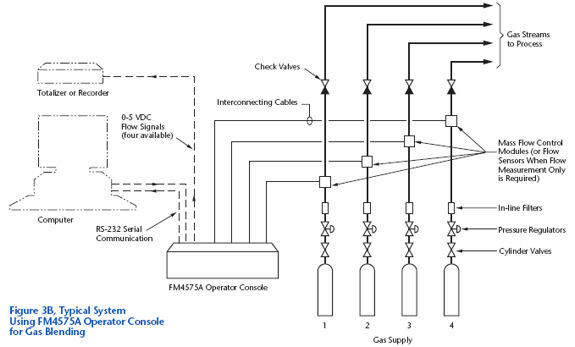 Interconnecting cables are used in all systems for coupling the Flow Sensors and Control Modules to the operator console. One cable is provided with each Sensor or Control Module purchased. With these 25 foot cables, the Operator Console can be remotely located away from the sensors and control modules. This enhances the operator's safety— especially when working with toxic or otherwise hazardous gases. All wetted parts of these systems (parts in contact with the gas) are of stainless steel construction with Viton® used as a sealing material. Other seal materials (Buna-N or Kalrez® ) are available on special order, allowing these systems to be used in nearly any gas service. in all gas handling systems to protect against overpressurization. Contact your Advanced Representative for more information.